With a wealth of information, elegant design, and time-tested advice, this beautiful beginner's book covers the most popular topic in ceramics. Just as in her celebrated workshops, artist Shay Amber guides would-be potters through all the basics of hand building, from pinching and coiling to draping slabs, adding gorgeous surface embellishments, and firing. Twelve teaching projects--including a pinched tea bowl and coil-built espresso cup set--build a repertoire of skills. Hundreds of step-by-step images demonstrate key steps while extensive galleries of images provide inspiration. 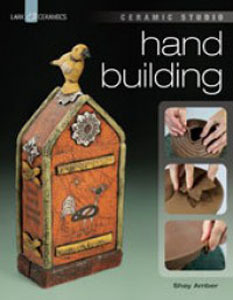 This book was formerly published in hardcover as Ceramics for Beginners: Hand Building. Shay Amber is a ceramic artist who works exclusively with hand-built forms. She holds a degree in ceramics from Ringling School of Art and Design, completed a three-year residency at Odyssey Center for the Ceramic Arts, and received a scholarship to Watershed Center for the Ceramic Arts. Shay's work is displayed in galleries and permanent collections nationally, and she lives in Asheville, NC.